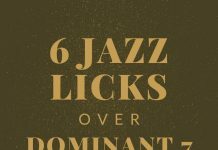 We often preach here on Learn Jazz Standards to learn solos and licks by the jazz greats. It’s important to be studying and listening to the great jazz musicians who came before us to learn how to play this music. When in search for some great jazz language to learn, one of my go-to guys is Dexter Gordon. If you don’t know who he is, be sure to look him up because he’s an important character in jazz. I love his warm, big sound that he gets out of his tenor sax. But when it comes to learning jazz language, Dexter is an excellent choice because I find that he plays in a relatively straight-forward manner. He plays a lot of eighth note lines, and they tend to be reasonably accessible. 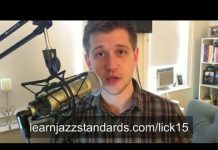 That’s why today I’m sharing with you 4 Dexter Gordon licks over the jazz standard Lady Bird. If you aren’t familiar with Lady Bird, click the previous link so you can check out the chord changes. 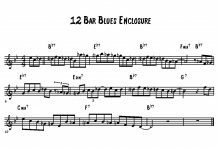 It’s an excellent tune by Tadd Dameron with a characteristic turn-around at the end. I’m drawing these licks from a live recording in Belgium in 1964. 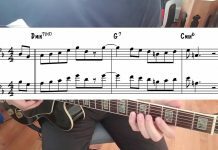 Use the video below to reference the licks I’ve notated for you. I would suggest trying to learn them by ear first, and then take a peak out how I notated them. Either way, enjoy practicing these! This is a solid ii-V-I lick that outlines the changes quite nicely. The interesting part of this lick is the Dmin7 arpeggio he outlines over the Cmaj7. The F natural gives it a suspended sound for a brief moment. Another great ii-V-I lick, this time with the classic turn-around at the end. I find it interesting the way he phrases. In particular how he anticipated the A natural going into bar 2. Dexter Gordon is known for playing behind the beat, and this could be an example of that. This is the first 5 bars of the song form. I’ve included this one because of the way Dexter uses long tones to express these changes. It’s very melodic and transitions nicely into the Fmin7-Bb7. This time there is a quarter note anticipation before the Cmaj7, which can throw you off if you don’t listen close enough. In this progression, the band is adding a chromatic ii-V that is not there in the original music. This is a great example both of how to approach a chromatic ii-V like this, and how to take an idea and translate it into a different key. Bar 2 is just a slight variation from Bar 1, a half step down, and with an eighth note anticipation into bar 3. 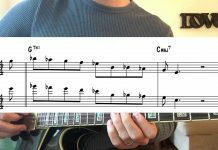 Study these licks, and if you want to take them even further, practice them in all 12 keys. THANK YOU Brent! This is so awesome! One of your coolest posts. I hope you will continue to show us some hip licks from the Greats.